There is something iconic about a Spectrum game with a black background and bright primary coloured sprites that makes it instantly almost impossible to dislike. And so with this in mind, and with the Specstalgia Goggles removed, I tried my best to take a hard attitude with these two games, right from the start; since they had already tried to disarm me with their pretty colours and far-too-happy-looking-to-be dead ghost protagonist. This proved impossible, because playing these two games is like gunning the Delorean to 88 and careening back to the Spectrum Ages, claiming a darkened boxroom and burning your retinas on a ZX Spectrum 48K for the whole night. Ghost Castle, and its sequel Ghost Castle 2 Special Edition, are very much retro games, as opposed to new games made for a retro system. This isn't a bad thing, before you ask. They're not remakes of anything, they are games put together as if none of the intervening decades between the Spectrum's final gasp and this hot minute ever happened, and it is a mammoth task to dislike these games in the slightest. These are new products but they play like classic games you dug out from under your bed that were concealed under a half inch of dust. If I held the box in my hand right now I'd be looking at the cover for the rating that Crash! magazine or Your Sinclair gave it. 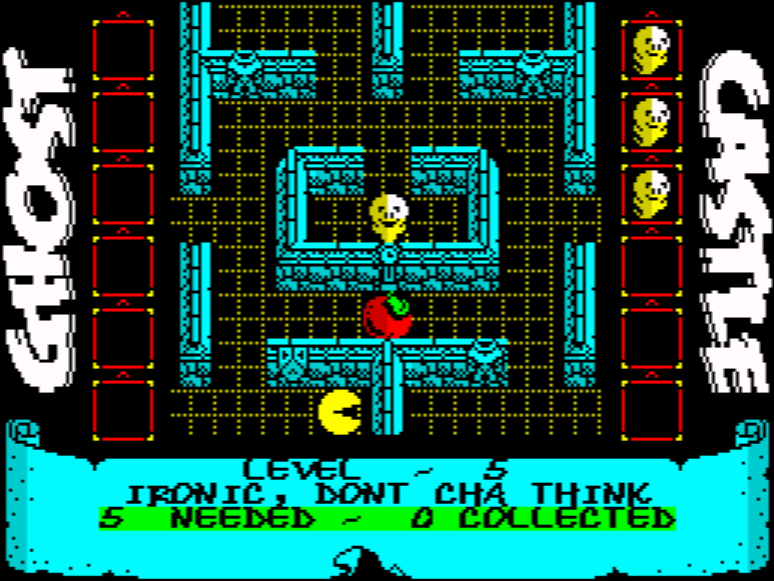 Ghost Castle the First is a straight up puzzle game, a top down, 2D quest to collect keys and avoid ghosts that look a lot less friendly than the Casper-a-like hero, in a time honoured flick screen Speccy style. What begins as a quite simple game quickly becomes tough, but in a challenging and fun way, not an abandoning and deleting way. The gameplay is satisfying and rewarding, with humour (like the level where the ghostly hero finds himself navigating a somehow familiar looking map while hungry yellow circles attempt to eat him) interspersed with moments of real tension and excitement. 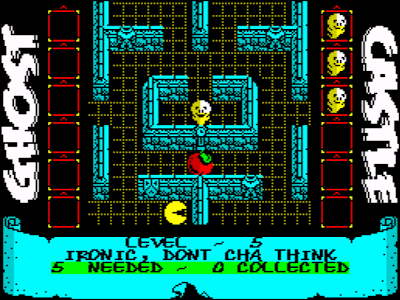 The graphics are sharply rendered and characterful, retaining the classic Spectrum look. The sequel, available on the same tape, is more of an arcade puzzle affair, and kicks off with a catchy theme tune - which is unexpected after the silent front screen of the first game. Ghost Castle 2 sees the hero, having escaped from the castle, roaming the grounds in search of an amulet. The bad guys this time are the innocuous looking but deadly (Un-deadly? Double-killy? How do you describe something as being able to kill a ghost?) animals that infest the gravestone-strewn map. On the subject of the map, remember the stories of people burning out their Spectrums and C64s by pausing the game at every screen to map out levels? I could imagine this game taking its toll of processors in such a way if it had been out in the 80s. Then again, this could be just my sense of direction being a bit crap, or the detrimental effect of my day job on higher and more important mental functions like playing computer games! Either way I got lost a fair bit, but not to the extent that I took a hissy and stomped off to play Doom. The sequel is just as entertaining and playable as Ghost Castle, perhaps a bit harder, and this time equips the player with a twinkly ghost magic missile to fling at enemies. It bounces off walls too, which is a neat trick and I felt dead smug the first time I managed to kill something with a rebound shot. Despite the added shooty aspect it's still primarly a puzzle game. Baddies you kill respawn within seconds, and it's not a game you can run and gun through. 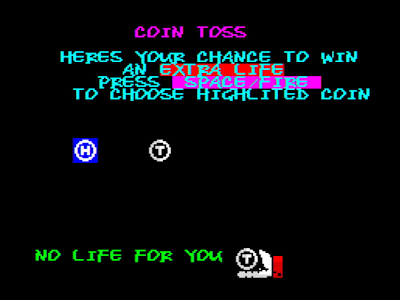 The well laid out levels are littered with bonuses, with occasional mystery boxes to either ruin or make the player's day; opening one can lead to a minigame with an extra life as a prize, release a gang of enemies, or uncover a useful item. Both of these games are massively fun to play, quite addictive and thoroughly entertaining. The Bog Brothers development team really did a great job producing two games that essentially leaped through a 1980s timewarp, planted a nostalgia bomb under the liberated barstool standing in as my computer chair (times are hard) and then robbed me of hours of my life in a satisfying way. But now for the serious part. Most of the games we here at RGCD Towers cover tend to be freeware. The Ghost Castle bundle is, however, not. It is available to buy from Cronosoft (priced between £3.99 and £4.99 depending on postage) but all of the royalties from the game's sales are being donated to the Douglas MacMillan Hospice in North Staffordshire, which is mainly paid for by charitable donations and provides terminal and palliative care to cancer patients, as well as support to their families. Buy the game here (from the Cronosoft website).